Performing CPR on an infant is significantly more difficult than on an adult, requiring a much gentler approach and some fairly significant changes to the normal CPR procedure. The first, and most important, thing to do is to check if the infant is actually unresponsive. Accidentally performing CPR on an infant that doesn’t require it can be very dangerous. If they seem unresponsive, tap or flick the sole of their feet to try and trigger a response. If they do not respond, check for breathing by looking for chest movement, listening for the sounds of normal breathing and seeing if you can feel their breath on your skin. Once you are certain that the infant is unresponsive and not breathing normally, you need to start CPR. 1. Rescue breathing – To perform a rescue breath on an infant, first ensure that their airway is clear, removing anything that might be blocking it. Then take a breath in and place your lips around the baby’s mouth and nose, forming an airtight seal. If your lips can’t form a seal around the baby’s mouth and nose, close the baby’s mouth and make a seal around the nose only. Blow steadily into the mouth or nose, and watch for the infant’s chest rising, when it does, break the seal around the nose and mouth, allowing the chest to fall. Repeat this process four times and then perform 30 chest compressions. 2. 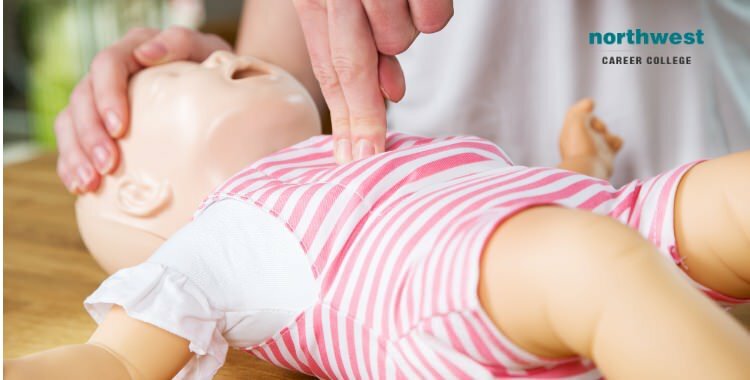 How to give a chest compression to an infant – Because of the difference in size, performing chest compressions on an infant is significantly different from performing them on an adult. To start, place two fingertips on the center of the baby’s chest, then press down on the breastbone, depressing the chest down by at least one-third of its depth. Without moving your fingers, allow the check to re-inflate fully. One full depression and re-inflation is one “compression.” Repeat this procedure 30 times at the rate of one every two seconds, followed by 2 rescue breaths, until the infant starts breathing again. 3. How to put an infant in the recovery position – Once the infant has started breathing again, you will need to put them in the recovery position until the emergency services arrive. Obviously, this is significantly different from the recovery position for adults and involves cradling them in your arms, with their head tilted downwards. This will keep their airway open and stop them choking on their tongue or breathing in any vomit. Here at Northwest Career College, we are committed to providing affordable, quality CPR classes to the Las Vegas community. We pride ourselves on being an American Heart Association (AHA) testing center and we offer Las Vegas CPR classes designed to fit your personal needs and professional schedule. As part of our “student-focused” approach to education, we also offer our CPR classes free of charge to all of our students. Call us today at (702) 403-1592 to book your CPR class and become qualified to save a life in just 4 hours!